Erbium is a chemical element with symbol Er and atomic number 68. A silvery-white solid metal when artificially isolated, natural erbium is always found in chemical combination with other elements. It is a lanthanide, a rare earth element, originally found in the gadolinite mine in Ytterby in Sweden, from which it got its name. Erbium's principal uses involve its pink-colored Er3+ ions, which have optical fluorescent properties particularly useful in certain laser applications. Erbium-doped glasses or crystals can be used as optical amplification media, where Er3+ ions are optically pumped at around 980 or 6994148000000000000♠1480 nm and then radiate light at 6994153000000000000♠1530 nm in stimulated emission. This process results in an unusually mechanically simple laser optical amplifier for signals transmitted by fiber optics. The 6994155000000000000♠1550 nm wavelength is especially important for optical communications because standard single mode optical fibers have minimal loss at this particular wavelength. In addition to optical fiber amplifier-lasers, a large variety of medical applications (i.e. dermatology, dentistry) rely on the erbium ion's 6994294000000000000♠2940 nm emission (see Er:YAG laser) when lit at another wavelength, which is highly absorbed in water in tissues, making its effect very superficial. Such shallow tissue deposition of laser energy is helpful in laser surgery, and for the efficient production of steam which produces enamel ablation by common types of dental laser. with a half-life of 7000226900000000000♠2.269 s.
are element 67 (holmium) isotopes, and the primary products after are element 69 (thulium) isotopes. Erbium (for Ytterby, a village in Sweden) was discovered by Carl Gustaf Mosander in 1843. Mosander was working with a sample of what was thought to be the single metal oxide yttria, derived from the mineral gadolinite. He discovered that the sample contained at least two metal oxides in addition to pure yttria, which he named "erbia" and "terbia" after the village of Ytterby where the gadolinite had been found. Mosander was not certain of the purity of the oxides and later tests confirmed his uncertainty. Not only did the "yttria" contain yttrium, erbium, and terbium; in the ensuing years, chemists, geologists and spectroscopists discovered five additional elements: ytterbium, scandium, thulium, holmium, and gadolinium. Erbia and terbia, however, were confused at this time. A spectroscopist mistakenly switched the names of the two elements during spectroscopy. After 1860, terbia was renamed erbia and after 1877 what had been known as erbia was renamed terbia. Fairly pure Er2O3 was independently isolated in 1905 by Georges Urbain and Charles James. 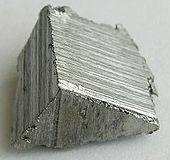 Reasonably pure erbium metal was not produced until 1934 when Wilhelm Klemm and Heinrich Bommer reduced the anhydrous chloride with potassium vapor. It was only in the 1990s that the price for Chinese-derived erbium oxide became low enough for erbium to be considered for use as a colorant in art glass. The concentration of erbium in the Earth crust is about 2.8 mg/kg and in the sea water 0.9 ng/L. This concentration is enough to make erbium about 45th in elemental abundance in the Earth's crust. Like other rare earths, this element is never found as a free element in nature but is found bound in monazite sand ores. It has historically been very difficult and expensive to separate rare earths from each other in their ores but ion-exchange chromatography methods developed in the late 20th century have greatly brought down the cost of production of all rare-earth metals and their chemical compounds. The principal commercial sources of erbium are from the minerals xenotime and euxenite, and most recently, the ion adsorption clays of southern China; in consequence, China has now become the principal global supplier of this element. In the high-yttrium versions of these ore concentrates, yttrium is about two-thirds of the total by weight, and erbia is about 4–5%. When the concentrate is dissolved in acid, the erbia liberates enough erbium ion to impart a distinct and characteristic pink color to the solution. This color behavior is similar to what Mosander and the other early workers in the lanthanides would have seen in their extracts from the gadolinite minerals of Ytterby. Crushed minerals are attacked by hydrochloric or sulfuric acid that transforms insoluble rare-earth oxides into soluble chlorides or sulfates. The acidic filtrates are partially neutralized with caustic soda (sodium hydroxide) to pH 3–4. Thorium precipitates out of solution as hydroxide and is removed. After that the solution is treated with ammonium oxalate to convert rare earths into their insoluble oxalates. The oxalates are converted to oxides by annealing. The oxides are dissolved in nitric acid that excludes one of the main components, cerium, whose oxide is insoluble in HNO3. The solution is treated with magnesium nitrate to produce a crystallized mixture of double salts of rare-earth metals. The salts are separated by ion exchange. In this process, rare-earth ions are sorbed onto suitable ion-exchange resin by exchange with hydrogen, ammonium or cupric ions present in the resin. The rare earth ions are then selectively washed out by suitable complexing agent. Erbium metal is obtained from its oxide or salts by heating with calcium at 7003172315000000000♠1450 °C under argon atmosphere. Used in nuclear technology in neutron-absorbing control rods. When added to vanadium as an alloy, erbium lowers hardness and improves workability. Erbium oxide has a pink color, and is sometimes used as a colorant for glass, cubic zirconia and porcelain. The glass is then often used in sunglasses and cheap jewelry. Erbium-doped optical silica-glass fibers are the active element in erbium-doped fiber amplifiers (EDFAs), which are widely used in optical communications. The same fibers can be used to create fiber lasers. In order to work efficiently, erbium-doped fiber is usually co-doped with glass modifiers/homogenizers, often aluminum or phosphorus. These dopants help prevent clustering of Er-ions and transfer the energy more efficiently between the Er ions and the signal. Co-doping of optical fiber with Er and Yb is used in high-power Er/Yb fiber lasers. Erbium can also be used in erbium-doped waveguide amplifiers. An erbium-nickel alloy Er3Ni has an unusually high specific heat capacity at liquid-helium temperatures and is used in cryocoolers; a mixture of 65% Er3Co and 35% Er0.9Yb0.1Ni by volume improves the specific heat capacity even more. A large variety of medical applications (i.e. dermatology, dentistry) utilize erbium ion's 6994294000000000000♠2940 nm emission (see Er:YAG laser), which is highly absorbed in water (absorption coefficient about 7006120000000000000♠12000/cm). Such shallow tissue deposition of laser energy is necessary for laser surgery, and the efficient production of steam for laser enamel ablation in dentistry. Erbium does not have a biological role, but erbium salts can stimulate metabolism. Humans consume 1 milligram of erbium a year on average. The highest concentration of erbium in humans is in the bones, but there is also erbium in the human kidneys and liver. Erbium is slightly toxic if ingested, but erbium compounds are not toxic. Metallic erbium in dust form presents a fire and explosion hazard. ^ a b c d e Emsley, John (2001). "Erbium". Nature's Building Blocks: An A-Z Guide to the Elements. Oxford, England, UK: Oxford University Press. pp. 136–139. ISBN 978-0-19-850340-8. ^ Sato, Yuta; Suenaga, Kazu; Okubo, Shingo; Okazaki, Toshiya; Iijima, Sumio (2007). "Structures of D5d-C80 and Ih-Er3N@C80 Fullerenes and Their Rotation Inside Carbon Nanotubes Demonstrated by Aberration-Corrected Electron Microscopy". Nano Letters. 7 (12): 3704. Bibcode:2007NanoL...7.3704S. doi:10.1021/nl0720152. ^ "Chemical reactions of Erbium". Webelements. Retrieved 2009-06-06. ^ a b Audi, Georges; Bersillon, Olivier; Blachot, Jean; Wapstra, Aaldert Hendrik (2003). "The NUBASE Evaluation of Nuclear and Decay Properties". Nuclear Physics A. 729 (1): 3–128. Bibcode:2003NuPhA.729....3A. CiteSeerX 10.1.1.692.8504. doi:10.1016/j.nuclphysa.2003.11.001. ^ Mosander, C. G. (1843). "On the new metals, Lanthanium and Didymium, which are associated with Cerium; and on Erbium and Terbium, new metals associated with Yttria". Philosophical Magazine. 23 (152): 241–254. doi:10.1080/14786444308644728. Note: The first part of this article, which does NOT concern erbium, is a translation of: C. G. Mosander (1842) "Något om Cer och Lanthan" [Some (news) about cerium and lanthanum], Förhandlingar vid de Skandinaviske naturforskarnes tredje möte (Stockholm) [Transactions of the Third Scandinavian Scientist Conference (Stockholm)], vol. 3, pp. 387–398. ^ Piguet, Claude (2014). "Extricating erbium". Nature Chemistry. 6 (4): 370. Bibcode:2014NatCh...6..370P. doi:10.1038/nchem.1908. ^ "Facts About Erbium". Live Science. July 23, 2013. Retrieved 22 October 2018. ^ Ihde, Aaron John (1984). The development of modern chemistry. Courier Dover Publications. pp. 378–379. ISBN 978-0-486-64235-2. ^ a b c Patnaik, Pradyot (2003). Handbook of Inorganic Chemical Compounds. McGraw-Hill. pp. 293–295. ISBN 978-0-07-049439-8. Retrieved 2009-06-06. ^ Early paper on the use of displacement ion-exchange chromatography to separate rare earths: Spedding, F. H.; Powell, J. E. (1954). "A practical separation of yttrium group rare earths from gadolinite by ion-exchange". Chemical Engineering Progress. 50: 7–15. ^ Parish, Theodore A.; Khromov, Vyacheslav V.; Carron, Igor, eds. (1999). "Use of UraniumErbium and PlutoniumErbium Fuel in RBMK Reactors". Safety issues associated with Plutonium involvement in the nuclear fuel cycle. CBoston: Kluwer. pp. 121–125. ISBN 978-0-7923-5593-9. ^ a b Hammond, C. R. (2000). The Elements, in Handbook of Chemistry and Physics (81st ed.). CRC press. ISBN 978-0-8493-0481-1. ^ Becker, P. C.; Olsson, N. A.; Simpson, J. R. (1999). Erbium-doped fiber amplifiers fundamentals and technology. San Diego: Academic Press. ISBN 978-0-12-084590-3. ^ Kittel, Peter (ed.). Advances in Cryogenic Engineering. 39a. ^ Ackermann, Robert A. (1997). Cryogenic Regenerative Heat Exchangers. Springer. p. 58. ISBN 978-0-306-45449-3. ^ Haley, T. J.; Koste, L.; Komesu, N.; Efros, M.; Upham, H. C. (1966). "Pharmacology and toxicology of dysprosium, holmium, and erbium chlorides". Toxicology and Applied Pharmacology. 8 (1): 37–43. doi:10.1016/0041-008x(66)90098-6. PMID 5921895. ^ Haley, T. J. (1965). "Pharmacology and toxicology of the rare earth elements". Journal of Pharmaceutical Sciences. 54 (5): 663–70. doi:10.1002/jps.2600540502. PMID 5321124. ^ Bruce, D. W.; Hietbrink, B. E.; Dubois, K. P. (1963). "The acute mammalian toxicity of rare earth nitrates and oxides". Toxicology and Applied Pharmacology. 5 (6): 750. doi:10.1016/0041-008X(63)90067-X. Guide to the Elements – Revised Edition, Albert Stwertka (Oxford University Press; 1998), ISBN 0-19-508083-1. Wikimedia Commons has media related to Erbium. Look up erbium in Wiktionary, the free dictionary.